WHAS11's Best of Kentuckiana | Louisville Real Estate with the Joe Hayden Real Estate Team - Your Real Estate Experts! We here at the Joe Hayden Real Estate Team have been nominated for WHAS11's Best of Kentuckiana awards, and we couldn't be more excited! We pride ourselves on delivering the absolute best customer service to our clients, whether buying or selling, to allow them to make a knowledgeable and informed decision in their transaction. Please consider voting for us, as we would be extremely honored to have your vote! 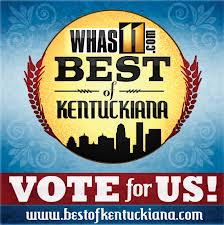 To vote for The Joe Hayden Real Estate Team for Best of Kentuckiana, please visit WHAS11 and find us under the Real Estate Agent/Company category! Visit our website to enjoy the Best Louisville Home Search and read articles on buying and selling.